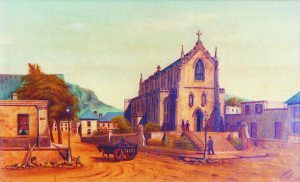 The story of the Cathedral Church of Our Lady of the Flight into Egypt in Cape Town. he story of the Cathedral Church of Our Lady of the Flight into Egypt in Cape Town, the seat of the Metropolitan Archbishop of Cape Town, is intimately associated with the history and development of the Roman Catholic Church in Southern Africa over a period of more than 175 years. Affectionately known by many as St Mary’s Cathedral, it is the oldest Catholic Cathedral in South Africa. The Cathedral is situated in the heart of the City of Cape Town, also known as the Mother City. Its position is directly opposite the South African Parliament and at the meeting point of an important thoroughfare linking Cape Town to its outlying suburbs. The Cathedral occupies a central position in relation to its significance and the ‘Mother Church’ both of the Archdiocese and of the rest of South Africa. The Cathedral, with its mid-nineteenth-century neo-gothic proportions and its characteristic lancet arches, stands as a powerful symbol of the Catholic faith in modern Cape Town. It has been a constant witness to the faith since it first opened its doors on 28th April 1851. United in both aesthetic and religious elements in its unique art collection, which played a key consideration in its second restoration in 1999, the first restoration taking place in 193.., the building is a living reminder of the enduring values and lasting contribution made by the Roman Catholic Church to the history of South Africa. The Roman Catholic faith, like many other religions in South Africa, has gathered within its bosom people from many countries, cultures and languages. The composition of the Cathedral parishioners as well as the numerous visitors to the Cathedral remind us of the true meaning of Catholicity, many peoples gathered together around a common faith and a common belief. South Africa was colonised in 1652 when the Dutch settled at the Cape. Between 1652 and 1804 the practice of the Catholic faith was largely conducted in secret. Due to the effects and influence of the Protestant Reformation, the Dutch were extremely anti-Catholic. With the arrival of the French Huguenot refugees in 1688 only added to this general attitude. Surviving records demonstrate the state of Catholicism at the Cape and relate how, for instance, a French bishop who had been shipwrecked in Table Bay in 1660 was forbidden to celebrate Holy Mass on shore. Six Jesuit priests landed in 1685 on an astronomical mission they too were not allowed to offer up Holy Mass on shore, nor were the Catholics allowed to go on board to attend Mass. However, they secretly did what they could to attend to the spiritual needs of the few Catholics at the Cape. The Catholic Church disappears from the pages of South African history from 1686 until 1804 when Advocate Jacob Abraham de Mist, the new Dutch Commissioner-General, declared religious tolerance and priests came from The Netherlands to tend to the scattered Catholic flock. A huge setback occurred, however, when the British took over the Cape Colony in 1806 and the Dutch priests were expelled. 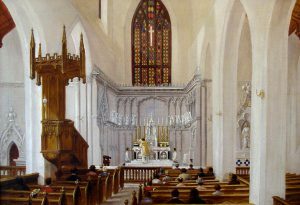 For some thirty years afterward the situation regarding the spiritual welfare of the Cape’s Catholics was uncertain – until the arrival of Bishop Patrick Raymund Griffith OP in April 1838. Bishop Griffith has been specially consecrated and appointed Vicar Apostolic of the Cape of Good Hope in 1837. Bishop Griffith encountered a demoralised, disorganised and debt-ridden Catholic community and a badly weathered chapel in present Harrington Street that was dedicated in 1822. Bishop Griffith chose as his patroness of his new vicariate Our Lady of the Flight into Egypt, to denote both the struggle of the Catholic people and the African dimension to his mission. His first major task was to find an appropriate site for a church structure that truly reflected the religious tolerance the Cape Colony claimed to possess and immediately set about raising monies among his flock. In 1839 the bishop purchased what was known as the Wachtenburg Garden, which was formerly a freemasons’ lodge and museum, respectively, together with a piece of ground in front known as Tanner’s Square for the sum of £2500 from Baron Carl Ferdinand Heinrich von Ludwig. The Cathedral now stands on the old Tanner’s Square. German architect Carl Otto Hager. Hager had designed numerous Dutch Reformed Churches in South Africa including the NG Moederkerk in Stellenbosch. The Cathedral was designed in the neo-Gothic idiom, with the characteristic features such as a high nave and steep roof, side aisles with flat roofs and crenelated parapets, slender in shape, pointed clerestory windows on the inside and an oak screen separating the nave from the entrance porch. Donations for the building project came from many sources, with large sums given by Bishop Patrick Joseph Carew and his associates from Calcutta, the Vicar Apostolic and people of Mauritius and by friends in State of Pernambuco, northeast Brazil. The construction period lasted ten years and costs amounted to £10 000 (£5000 being the original estimated cost). 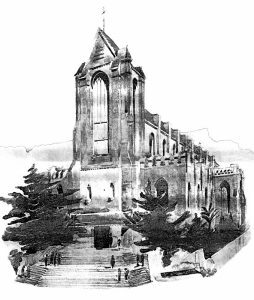 The Cathedral Church was dedicated by Bishop Griffith on 28th April 1851, the day before the Feastday of Our Lady of the Flight into Egypt.